After a fire destroys their home Nick, his brother and his dad move into his grandmother's home which his dad inherited. Nick finds that the attic is full of all sorts of junk so he decides to have a yard sale to get rid of it all. On the day of the sale the town is hit by a huge storm but when Nick's brother turns on an old lamp from the attic suddenly people arrive at their house despite the bad weather. And everyone there is desperate to buy something, paying much more than any of it is worth. When nearly everything is sold a group of men arrive asking after all the other items. Nick can't tell them much about who bought what so one of the men gives him a card and they purchase everything that is left. Nick doesn't think much more of it all until he becomes friends with a few of the kids who bought some of the items and learns that all of the stuff has strange, magical properties. 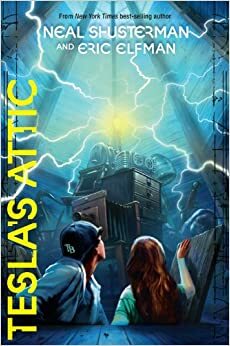 It turns out that everything in his attic was invented by Nikola Tesla and the men in the car are from the Accelerati, a group determined to use the inventions for their own nefarious purposes. I find that Shusterman varies from AMAZING, so good you can't believe it writing to fun, fine adventures that aren't very great. This book is in the latter category. It's obviously intended for a younger audience than some of his other work and it will appeal to that group, especially those who like a mysterious series with adult bad guys.